In mid-February 1944 Marian Elizabeth Smith, a young Wisconsin woman, met Marine Corps Lieutenant Eugene T. Petersen on the passenger train, El Capitan, as it made its 42-hour run from Los Angeles to Chicago. After a brief acquaintance, he left the United States to join the Third Marine Division on Guam and eventually to take part in the battle for Iwo Jima in February and March of 1945. The collected letters of their subsequent 18-month correspondence reveal much about wartime life at home and abroad. This correspondence represents a time capsule of current events as Smith and Petersen discuss Franklin Roosevelt, the United Nations, internationalism, popular movies, the French aviator and poet Antoine de St. Exupery, the comic strip Barnaby, and the frustrations of dealing with sometimes less-than- enlightened parents. 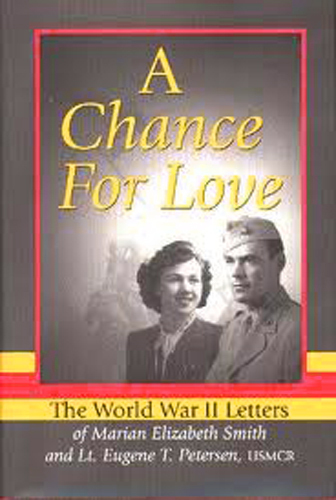 The loss of Marian's brother during the bombing of Ploesti, Rumania, in June 1944, brought Petersen and Smith closer together, and after hundreds of letters the "chance for love" Marian had suggested early in their correspondence evolved into a marriage that has endured for more than half a century. Eugene Petersen has taught at both the University of Detroit and the University of Michigan and served from 1966 to 1985 as the superintendent of the Mackinac Island State Park Commission.